Soul icon Bettye LaVette sings Bob Dylan songs on 2LP! For her 10th album and first album on a major label in nearly fifty years, legendary soul singer Bettye LaVette takes on the songs of Bob Dylan with the grit and experience that makes her one of the greatest living soul singers alive. Things Have Changed is a masterpiece of interpretation of one of the greatest songwriters alive, by one of the greatest soul singers alive. Produced by Steve Jordan, the album spans Dylan's catalogue and features guest appearances by Keith Richards and Trombone Shorty. 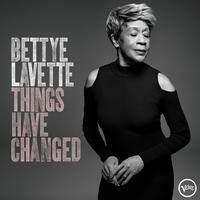 Since the great 21st century rediscovery of Bettye LaVette returned her to prominence, she has worked extensively in the rock and folk idioms, with her unique takes on songs by the likes of The Who, The Rolling Stones, Pink Floyd, Fiona Apple, and Dolly Parton. But never before has she devoted an entire album to the material of one songwriter. Things Have Changed spans more than five decades of Dylan songs, from 1964's immortal "The Times They Are A-Changin'" up to "Ain't Talkin'," the epic final track on his 2006 album Modern Times. "Other people write songs, but he writes vignettes, more prose than poetry. I didn't find his words to be pretty so much as they are extremely practical or extremely logical. He can work things like ‘go jump off a ledge' into a song," says Lavette. Lavette has only come face-to-face with Bob Dylan once, at a festival in Italy. Both backstage, Dylan was preparing to go on when his longtime bassist Tony Garnier pointed out Lavette. Dylan immediately stopped, walked over, and grabbed Lavette's face in his hands and kissed her, and headed out to play his show. Things Have Changed sees Dylan's songs seriously transformed: "I had never really listened to 'It Ain't Me Babe,'" she says. "But I had to make it more dismissive — not fast and hard, but like a Jimmy Reed tune. And 'The Times They Are A-Changin,' I had to flip that all the way round, so we worked up the groove on a beat box. That just made it extremely surprising."